I love making boozy marshmallows, full stop. They’re great in hot chocolate in winter and roasted over campfires in summer (a coating of sugar makes for a caramelized shell like WHOA). 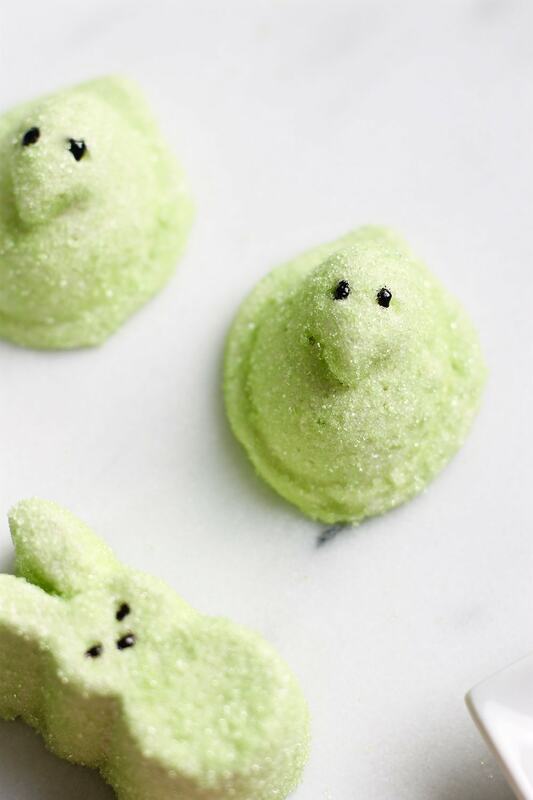 But I’m especially excited to share them in a spring time application: Peeps! First, a confession: I, Colleen, have a serious sweet tooth. 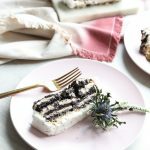 I never end a meal without dessert (sometimes even lunches, guys — I know, I have a problem). So although I like to keep my cocktails fairly dry, I’m constantly trying to sneak some liquor into cakes, candies and milkshakes. When you make a boozy dessert, a lot of times the alcohol is meant to cook off. But when you’re working with gelatin (as in when you make marshmallows), you get to keep the flavor AND the buzz factor. 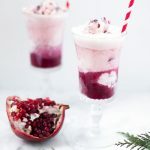 With all of the fun molds out there these days, I’m constantly tempted to make edible cocktails in an ever-growing list of shapes! 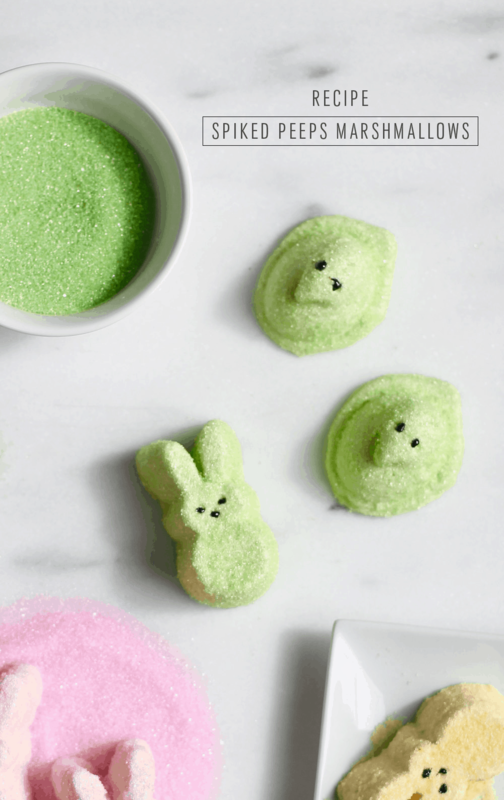 When I saw the adorable Peep mold in my local grocery (you can get one online or in craft stores, too), I knew I had to go for it. 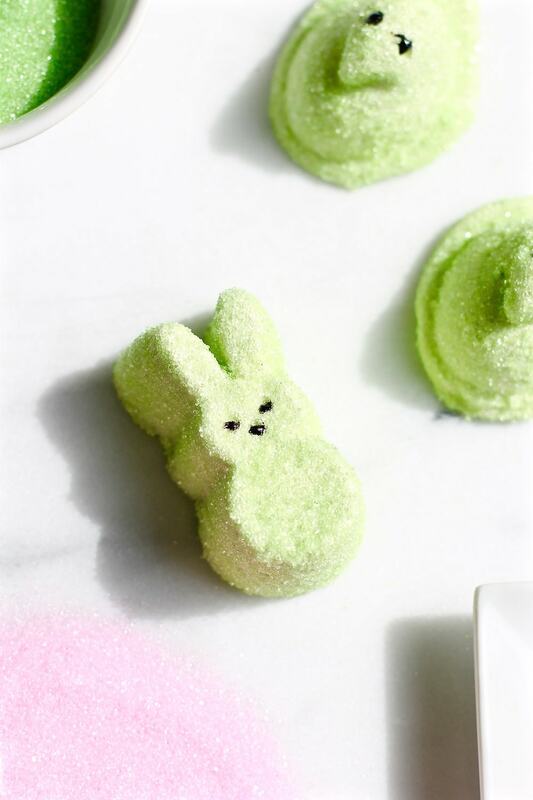 If you’ve got a sweet tooth and want to indulge in some Easter nostalgia while retaining your grown-up card, you really need to try these Boozy Peeps! 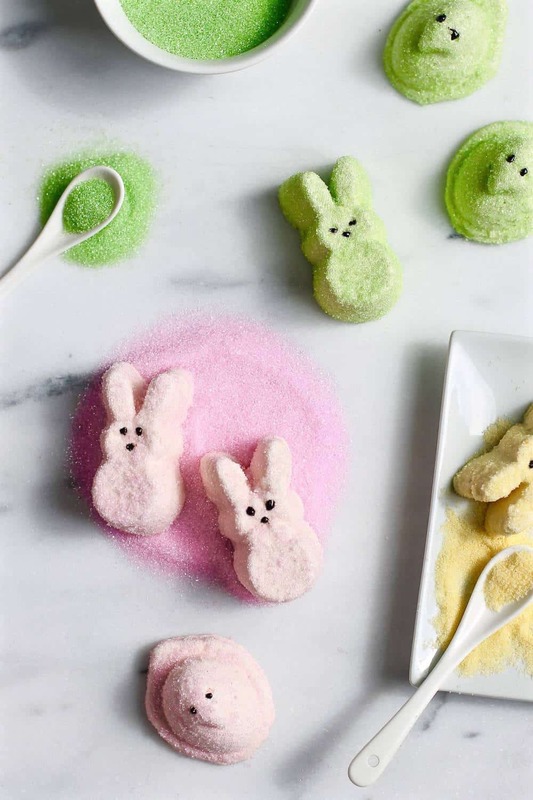 Spray your weapons lightly with cooking spray: Peeps mold, a rubber spatula, a butter knife, and a parchment paper lined loaf pan for any leftover marshmallows (waste not, want not). Pour the liqueur into the bowl of your stand mixer and sprinkle the gelatin on top. Allow to sit and expand for at least 10 minutes. 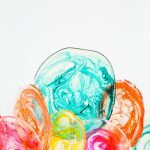 While your gelatin softens, clip a candy thermometer to a small, heavy-bottomed saucepan and add the sugar, corn syrup, water and salt. Heat over medium high, stirring constantly, until the mixture comes to a boil. Stop stirring, skim off any foam, and allow mixture to continue boiling until the thermometer reads 240 degrees Fahrenheit, occasionally brushing the sides of the pan with a wet pastry brush. As soon as the mixture hits 240 degrees, turn your mixer on low speed and very carefully pour the hot syrup down the side of the bowl in a slow and steady stream. Increase the speed to high and continue to beat for 12 minutes. 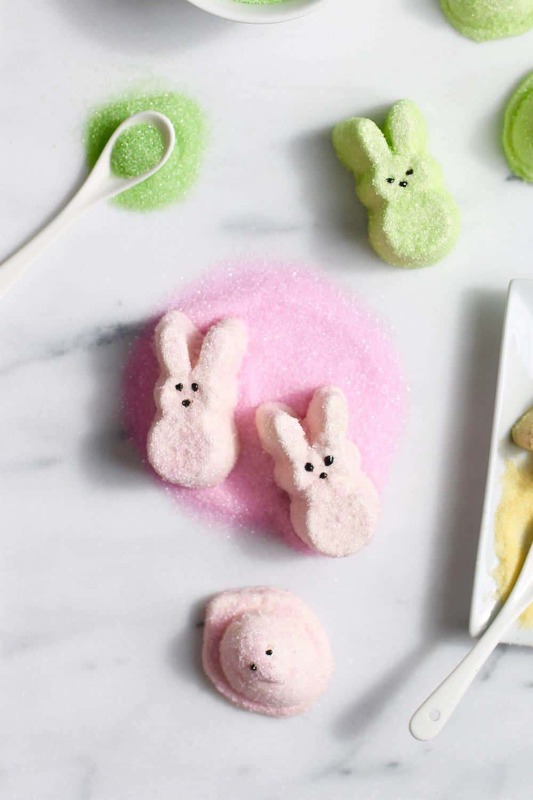 As quickly as possible, pour your warm marshmallow goo into the Peeps molds using the oiled spatula to help guide you (you can also use a pastry bag to do this, but I tried it both ways and preferred to pour directly). Let stand at room temperature for at least three hours or overnight. Gently remove the peeps with an oiled butter knife (this is possibly the most annoying part, but be patient -- if you rush them out, they will loose their shape!) and immediately roll them in colored sanding sugar (powdered sugar also works for a more matte look). To make faces, use either brown decorating gel or melted chocolate in a tiny piping bag (I figured the marshmallows were enough mess for my kitchen to handle, so I went the easy route with gel). Store on parchment paper in a single layer (no stacking) in an airtight container at room temperature. I used Pimm’s No. 1 as my liqueur because I start craving that lightly fruity, herbal flavor as soon as warm weather hits (and also because I wanted to be able to call them ‘Pimm’s Peeps’ which sounds adorable), but you can use anything you like. I’ve made them with St. Germain, Branca Menta, Campari and Cointreau and loved every single version. 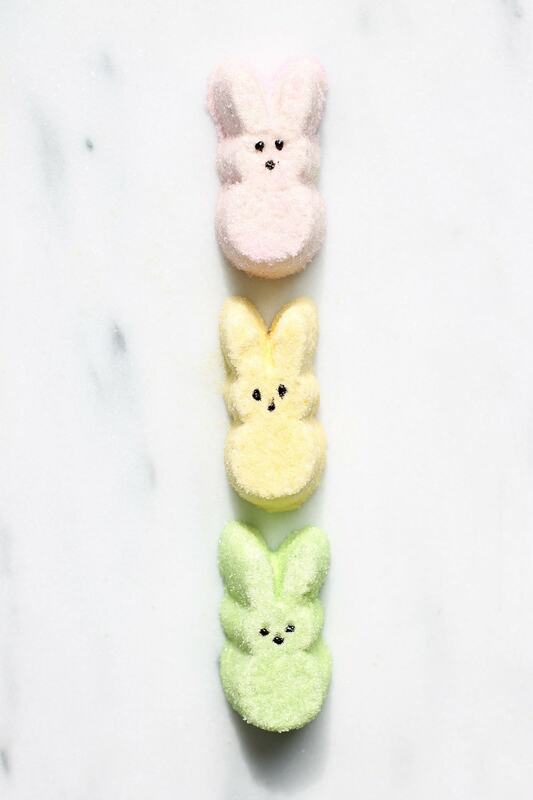 How cute would these little guys be as part of an epic Easter brunch tablescape? A Peep at each table setting on a tiny plate. How would you style them? 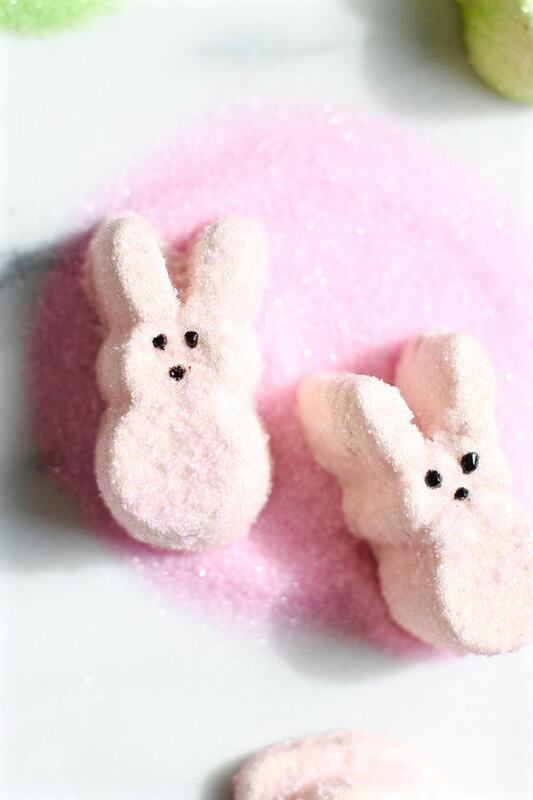 I never thought I wanted to make marshmallows until i seen these cutie patooties. what is the weight equivalent for the gelaTin? We dont have that brand here so i have no idea how much gelatin you used. This is seriously the most amazing idea ever!!! I cannot wait to try these bad boys out! I just found your blog and I must say, I am totally obsessed!!! Bravo. 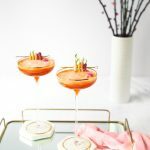 this is an insanely good idea and I need to make these asap for the easter brunch i’m attending on sunday!